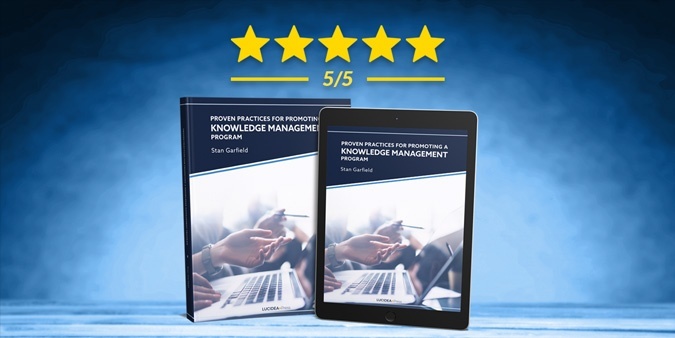 Jean-Claude Monney, Chief Knowledge Officer, Microsoft Enterprise Services, recently awarded five stars to Stan Garfield’s new book titled Proven Practices for Promoting a Knowledge Management Program. This comprehensive text, published by Lucidea Press, is an actionable guide to promoting knowledge management practices within your organization. If you want your KM program to achieve maximum success, you simply must read this book. As a practitioner you understand the value of KM, but this is the book that will help you convince others. You need more than an effectively designed and implemented KM solution: it needs to be sold. Stan’s book is designed for those of us who are not natural born marketers. He takes KM concepts and recasts them as easy to understand concepts that communicate value. Have you ever been asked, perhaps while riding the elevator, what your KM project is doing for the organization? Stan’s book helps you build a comprehensive sales and marketing campaign that will ensure your KM project succeeds. Each of its 15 chapters contains valuable nuggets for you to mine. If you’re not into selling or promoting, it’s even more important that you read this book, as it offers plenty of strategies that don’t require ‘cold calls’. At the very least, familiarize yourself with its Table of Contents. The book is designed to be valuable at the point of need; I guarantee even if you don’t read the whole book from front to back, you will reach for it from time to time over the course of your career. Stan has worked in the field of knowledge management for over 20 years as a senior executive as well as a consultant. He is also an author, speaker and community leader. Along the way, he has developed and gathered an incredible array of tools and advice that help KM practitioners achieve their goals. Lucidea, too, has been building and implementing knowledge management software for about as long as Stan has been in practice. We’ve participated in thousands of projects and strongly believe that Stan has discovered the secrets to KM success. To get people on board you have to promote, i.e., sell, your Knowledge Management program. It’s important to be aware that even if your program is up and running, it’s our opinion (and Stan’s) that you must continue promoting it for as long as you want it to exist. Stan and other KM practitioners all recognize that for a KM program to succeed it needs a champion. Being a KM Champion is not an easy task. We at Lucidea think of ourselves as champions of the KM cause, and we believe and hope that Stan’s book will make it easier for knowledge professionals to launch and sustain successful knowledge management programs. If our clients succeed, we all succeed.